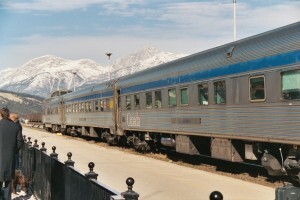 Via Rails Canadian train in Jasper National Park. Today we watch the Intro to Train Unit. Improve you English! That’s what Ramping Up your English is all about. In Episode 1, we introduce our content unit and begin our language activities. Intro to Train Unit: Welcome to a series of episodes that feature video clips and direct instruction to help intermediate English Learners reach higher levels of proficiency. As we explore exciting rail journeys, the greatest journey is the one you’re taking to elevate your level of English proficiency. As with all our episodes, this introduction is for English Learners from all language backgrounds who have already passed the beginning stages of learning English, and want to advance further. The intermediate stage can seem like being stranded at a train station between one’s place of departure and the destination. Ramping Up your English is designed to get you moving again toward your goal of higher English proficiency. That journey begins right now. Welcome aboard! Language Objective: Use your background knowledge about a subject to understand part of a visually supported presentation on that subject. Write a list of things you see in a video presentation (in your target language if your can; in your home language if you must). Use cognates and context clues to theorize the meaning of repeated vocabulary words. Academic Content Objectives: Transportation: Become familiar with the general concept of Trains and Railroads. Recognize and name the components of a railroad transportation system. You can see Episode 1 on my You tube channel, Ramp Up your English. Click here to see Episode 1. Segment 2: In Segment 2, I had viewers estimate how many words they understood in a longer theme clip, thereby performing a self assessment to be compared in the future with a clip of similar language level. The assignment was to Make a tally of understood words, or estimate a percentage of the narration that was understood. Segment 3: Here we introduced some basic unit theme vocabulary after viewing the video clip Trains Into 2. The basic unit words were: Train, Railroad, Freight, and Passenger. I modeled an approach to learning the meaning of unfamiliar words using context, provided by previous knowledge and the video clip. I also listed the words: Commuter Train, Coal Train, Freight Containers, and Conductors. railroad = 2nd part of word…road is camino. Surface of which the train moves? passenger = same as pasenjero in Spanish? The homework assignment is to use context clues and previous knowledge to find the meanings of these words. Use your knowledge and clues in the video clips to find what these words probably mean. Watch all three segments of Episode 1. For features of the program that follows, see Episode 2. Note to PEG programmers: This episode is available on the PEG website for use in your market.